My family of course, and not just this week but every week, and all my wonderful friends like you. Discovering new things like music from Shinedown, the TV show "The Killing" on AMC, and the TV show "Archer" on FX. This shirt. Must. Have. It. Asking Kyle to smile. He totally poses and makes a face for the camera. Playing softball again. It is that time of the year. Watching Real Salt Lake. Yes, Phats, that is a soccer team. 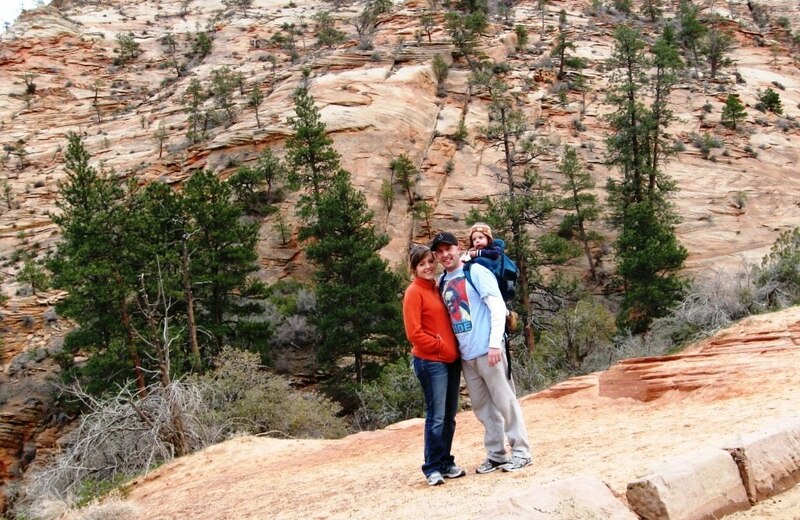 The memories from our Spring Break trip last month to Zion National Park. It is an absolutely beautiful, therapeutic, comforting, and inspiring place. I felt like I had a spiritual awakening when I was there. Rock stacking. Yes I stack rocks. I have collected a bunch of rocks recently for my rock garden. Having breakfast with Kyle, Elmo, Cat (Big Cat), Dex (Dexter), Bupurt (Rupurt), Noodles (Mr. Snoodle), and Car (Carl). The actual name of the stuffed animal is in parenthesis, and name Kyle calls them is not. Paying someone to hear you talk. Therapy might be a taboo subject for some people but it really helps me work out my issues. And boy do I have some issues. Me and the family enjoying Zion National Park. 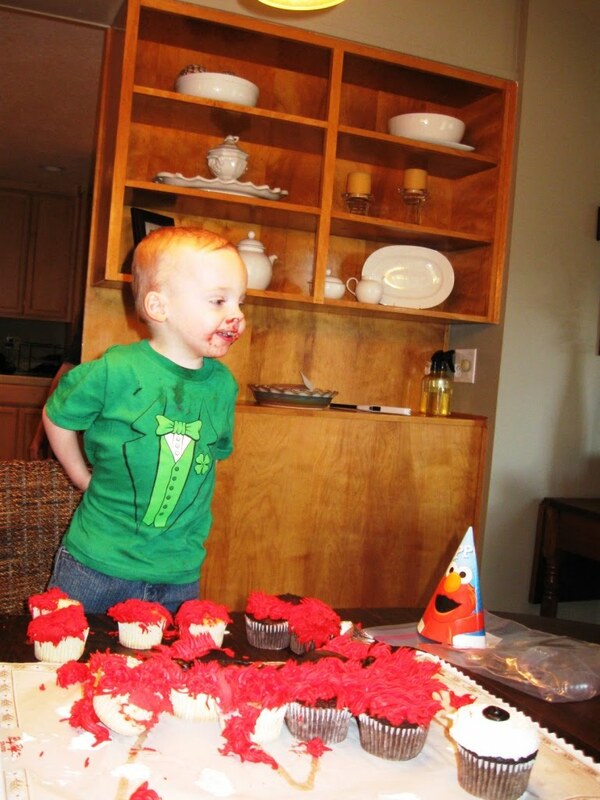 Kyle enjoying his birthday cupcakes. 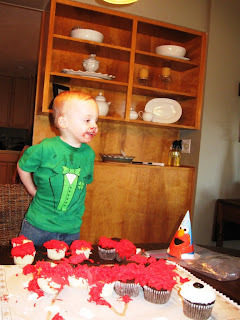 And of course the cake was designed to look like Elmo. Tank wishing Kyle a Happy Freakin' Birthday. Have a great rest of your week, and eat more pudding. Therapy is pretty awesome even though when you think about paying someone to listen to you, it sounds so silly. Your family is beautiful! All of the pictures are great. So many things to love, how lucky is that! 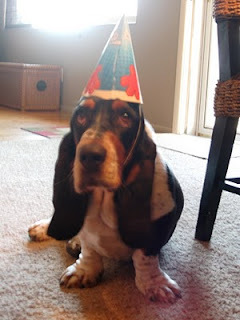 Today's pics are great, Kyle looks great covered in cake and Tank, well, I haven't seen such a cute doggy picture for years. Have a brilliant weekend. I'm just going to say that I think you are living your life in the very best way possible. And that you have a very darling boy. perfect picture of the tankster. i'm thoroughly enjoying watching our mls team. for an expansion team they're more competitive than i thought they'd be. It sounds like Zion N.P. is a great place. "Confessions of a rock stacker"
Paying someone to hear you talk must be working, I did know you had any issues, you seem pretty together to me. @Radioactive girl - Thanks. It is sort of silly when you think about it but the whole ambience and environment I guess bring out my inner demons. @Valerie - Thanks a bunch, and you have a good weekend as well. @Ms. Moon - Appreciate it. It has been a process for sure but I think I am getting closer to where I want to be as a person. Hopefully I can keep it up. @BP - The 'Caps have some moxie. Doing a lot better than people thought. It will be interesting to see how they do once the season gets longer and their depth is tested. @Texlahoma - It is a very cool place. I might have to start a new blog with that title to showcase some of my stacks. And I am glad you think I am not nuts but there are days when I feel like it. #3: Where's dat Paypal button? I was going to totally hook you up with some shirt cash. #5: Looking forward to the ugly bruise pictures. @Red - Thanks for the offer but I am hoping it was a big enough hint to Mrs. Shife as my birthday is rapidly approaching. And hopefully no ugly bruises this year. It would be nice to have a injury-free season. Definitely recommend talking to a qualified professional. Ok... now you're making me want to be Patty Positive and rethink my current pissy attitude. Therapy is good because you don't feel guilty talking about yourself too much because you're paying them. Kids are awesome because you can't hate them because they're just kids, after all. That's why I like having them as my clients and coworkers. They're who I work for, and I don't give a damn about the adults, to be honest. I'm definitely jealous of the trip to Zion. I've wanted to go there, and a few other parks for several years now. I wish I was closer, but that's the price you pay for having beaches in driving distance. It'll make a good family trip one of these days. What is it about a cake that makes little boys just want to smear icing every where? I've got to start watching this Archer show. I've heard nothing but good things about it.